Is an energetic and caring person, who loves to serve others with the skills and talents he has learned and developed over the years. He believes that every person has the potential within themselves to lead a healthy and happy life. Through his analytical nature and constant drive for perfection of his craft, he hopes to help others with specific chiropractic care. His vision is to help families, friends, and his community by teaching the benefits that specific Upper Cervical Chiropractic care can provide. His passion shines through in the time he takes to listen to his patients, express his understanding of their health concerns, thoroughness of his evaluations, and the hope he inspires within his patients that their overall health is in great hands. Born and raised in North Carolina, Dr. Blue now proudly calls Conway, SC home. He and his wife, Kaedra, have been married since 2007 and have 4 children. Dr. Blue graduated from Appalachian State University where, as a student-athlete, he earned a Bachelor of Science degree in Communication. He went on to play professional football in the European league in Germany, after which he returned to the States and began his career in the healthcare industry as a personal trainer. Looking to further assist people in achieving a life of physical well-being, he attended and graduated from Missouri College as a Massage Therapist. 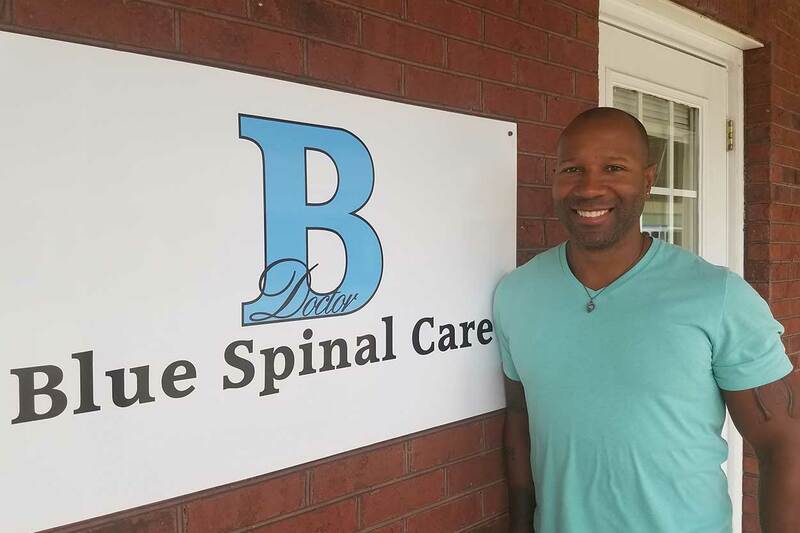 In his pursuit to do everything he could to serve people’s health needs, Dr. Blue enrolled in and graduated from the prestigious Life University in Marietta, GA with a Doctorate of Chiropractic degree. He chose to become a specialist in Chiropractic by directing his focus and training on the upper cervical spine. His technique of choice is Blair Upper Cervical Specific. Dr. Blue is a member of the Blair Chiropractic Society. He received his technique proficiency certification in 2014. Dr. Blue’s inspiration comes from a strong foundation in God, a stable family environment, and a dedication to provide the best care possible to his patients. He and his family look forward to serving you, your family, and the community through his practice by helping to alleviate health concerns naturally. “Health is an independence, not a dependence,” Let Dr. Blue help you unleash your body’s natural healing potential.